Since the blatant but failed attempt on Martin Bryant’s life in December 2000, the mainstream media and other interest groups have gone into overdrive, attempting to deflect public attention away from the core scientific evidence that proves his innocence. The methods vary but the objective appears to remain the same: use unacceptable hearsay testimony and inaccurate guesswork to overwhelm the existing hard scientific evidence, thereby denying Martin Bryant the trial he has not yet been allowed. As any competent police detective will confirm, hearsay evidence and guesswork are instant death to any serious inquiry, leading investigators and readers into numerous blind alleys from which there is little chance of escape. For example, suggesting the mass murder was "probably" planned to take place on the Isle of the Dead near Port Arthur, or on board a ferry on its way to the Isle of the Dead, deflects away from the reality that the principal crime scene was the Broad Arrow Café. At the same time this approach indirectly implies a specific form of advance planning that can never be proved in scientific terms. Great material for a "whodunit" crime novel perhaps, but useless and confusing within the confines of a serious mass murder investigation. Attempts have also been made to "stretch" the time the shooter actually fired inside the Broad Arrow Café, and the total number of rounds expended. This is a far more damaging claim, leading as it does to the inevitable image of a slower clumsy shooter, one that might more easily be compared with random killers like Kip Kinkel in Springfield, or Michael McDermott in Wakefield. After the bodies at Springfield and Wakefield were removed, both crime scenes bore all the hallmarks of a major military engagement: ejected cartridge cases by the score, and dozens of expended whole bullets and fragments that missed their targets buried in the walls, ceiling and furniture. Springfield and Wakefield were forensic gold mines, littered with enough exhibits to keep the crime labs busy for months. This was certainly not the case in the Broad Arrow Café at Port Arthur. 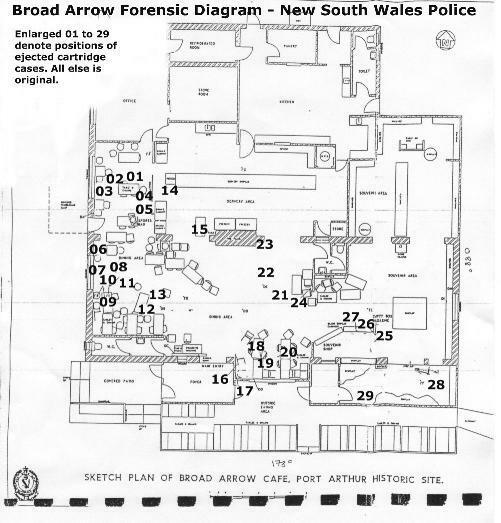 As the official forensic diagram compiled by the New South Wales Police scientific team shows in great detail (see picture), there were only 29 ejected cartridge cases, and a total of seven bullet fragments. We know that all 29 bullets hit their intended targets because we have the post mortem results for the victims, and we also know that fragments from three of those same bullets injured a further three victims, resulting in 32 dead or injured for only 29 shots fired. The forensic diagram also shows limited damage to the floor and furniture, but it must be remembered this damage does not include any residual bullets, bullet fragments or bone chippings. So far as the investigation is concerned, the damage serves only to illustrate the likely course or direction of travel of a bullet, or bullet fragment, or bone chipping, and cannot be meaningfully "added" to the seven existing bullet fragments in order to provide a more dramatic expanded total. The fragments require further explanation. Due to the unusual mass and velocity combination of the 5.56-mm NATO (.223 Remington) round at close range, bullets do not stay intact when striking hard targets, as they would normally do in the case of the old .303 Lee Enfield round of World War 2 fame. On contact with the hard bone of a human skull for example, the old 150 grain .303 bullet would create an entry wound, then use its mass [weight] and resulting inertia to continue through the skull and punch a larger exit wound through the rear. Though the .223 Remington round used at Port Arthur has the same overall kinetic energy as a .303 Lee Enfield at the point of impact, it lacks the mass and inertia needed to continue through hard bone because it only weighs 55 grains. The massive kinetic energy expended at the point of impact with hard bone, causes the little.223 Remington bullet to fragment, in turn frequently causing the skull to explode due to a sudden increase in internal hydrostatic pressure. The result? Bullet fragments and bone chips continuing on from the primary target to injure further victims. This ugly characteristic of the .223 Remington round at close range, has been proved on hundreds of occasions during the last three months in Palestine. Children hit in the shin or knee by identical rounds fired by Israeli soldiers and settlers, invariably have their legs amputated, because the shattered mess of bullet fragments muddled up with hundreds of bone chips, makes effective remedial surgery impossible. Where Port Arthur is concerned, remember that unlike the Hoddle Street and other open-air murders, the mass murder in the Broad Arrow Café took place within a completely confined space, thereby restricting residual evidence to the same confined area. To prove this mass murder was the same as (or even vaguely similar to) the random events at Springfield and Wakefield, would require at least two dozen bullet holes and associated 100 – 150 bullet fragments to validate the comparison. There were none of these items, and because the mere seven fragments found in the Broad Arrow most probably originated from the same three frag through-shots that injured victims 30-32, the crime scene was almost spookily clean. This, shrieked the lack of evidence, was the work of a man who never missed his targets. It may have been this very lack of visible evidence that led to the Tasmanian Government order for the premature destruction of the internal structure of the Broad Arrow Café. Not to "hide evidence" as some have speculated, but rather to hide the more damning total lack of evidence or artifacts: evidence and artifacts that would later be required in court to validate the "lone nut" and thus "random" shooting. Anyone trying to subtly deflect away from the harsh reality of the expert shooter in the Broad Arrow, might imply that the thorough official forensic diagram was later "altered" or "forged" to fit the evidence submitted in the Supreme Court of Tasmania. This is not only an insult to the entire New South Wales Police scientific team, it is also hopelessly irrational. Any attempt at forgery down the line would be aimed at significantly increasing the "evidence" in order to enhance the illusion of a "lone nut" random event. The New South Wales Police scientific team did not forge, alter, or delete anything. By generously placing its official forensic diagram in the public domain, the scientific team has provided you the reader with the official means to prove the Tasmanian Government’s story of the day was, and remains, an impossible lie. The alleged extended "total shooting time" in the Broad Arrow Café is easy to rebut. The audio tracks of two amateur video cameras filming at the time of the shooting accurately recorded the incredible speed of the shots, and were later submitted to the Supreme Court of Tasmania as evidence. The author has copies of these videos, both of which were subjected to extensive testing by audio experts using sophisticated computer audio analytical programs. There is not the slightest trace of forgery or editing breaks on either tape, both of which prove the astonishing rate of fire of the expert combat shooter. at Port Arthur. There is not an amateur shooter in the land who could get even close. Alternative views on Port Arthur are encouraged, because it is the democratic right of every individual to speak his or her mind on any subject. In this context it matters not whether the speaker is a New South Wales farmer, a Victorian security guard, or a Port Arthur survivor obliged to ride the harsh and emotional roller coaster of extended psychiatric hypnosis in Melbourne, Victoria, at Tasmanian Government expense. No matter who might decide to take the stand, he or she is entitled and encouraged to speak independently on the matter. The down side is that those who care about Australia and Australian national security should be very careful with their selection of words, especially at this late stage with the Federal and Tasmanian Governments known to be severely shaken by the reality that their best efforts have failed to quash the Port Arthur "conspiracy". In some cases the public might be tempted to question the underlying motives of those who seek to mislead their audiences, and subtly deflect away from the known hard scientific facts. Remember. Collectively as Australians we allowed government to imprison an intellectually impaired young man for a series of crimes he could not possibly have committed. At the time we all stood by meekly and allowed this to happen while raising not the slightest objection to Bryant’s severe abuse while on remand in Risdon Prison, nor to the fact that he should have been provided with a qualified guardian to protect him from his own lawyers. It is time to forget personal ego trips and "control" of the Port Arthur story. Martin Bryant needs a trial and he needs it now, before someone somewhere has time to arrange another "accident" in his lonely cell.